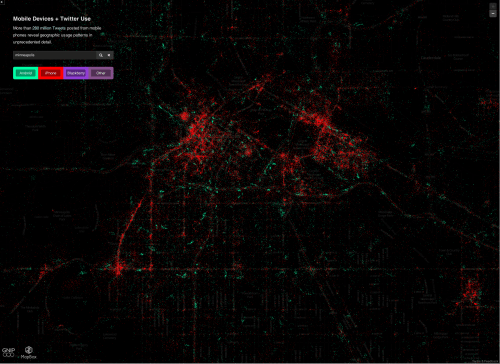 A map of where Twin Citizens use Twitter to tweet by mobile telephone. Lots of amateur sociology can make hay of the red/green split. Click on the image for the interactive map. What are the big trends that will shape transport? Alan Davies (The Urbanist) posts: What are the big trends that will shape transport? He riffs on my previous piece and Reihan Salam’s summary with an Australian take (numbers refer to Salam’s piece). (re trend 1. [new federalism]) I think this trend is more relevant to the US than Australia at this time, although Tony Abbott’s promise that a government led by him wouldn’t fund urban public transport might herald a structural change. (re trend 2.) The high cost and political difficulty of retro-fitting transport infrastructure in dense urban areas means the emphasis must necessarily shift to making existing infrastructure work better e.g. by road pricing; better networking; giving road space to other modes. (re trend 3.) The fuel excise in Australia isn’t hypothecated to roads, but it’s a very big revenue source. It brought in $15.5 billion in 2008/09 ($10 billion net). It would’ve been much more if indexation hadn’t been removed in 2001. (re trend 7.) I expect car-sharing (actually it’s more like car rental – riding a train is sharing) will grow, but still only account for a microscopic share of total travel. Widespread use of autonomous cars is the only way I see it possibly having a significant role. (re trend 8.) The dominant view among researchers is electronic communications increase the demand for face-to-face contact – and hence increase the demand for travel – rather than reduce it. (re trend 9.) What Prof Levinson calls consumer sovereignty also applies in other areas like specialist health care. (re trend 10.) I think the interesting trend Prof Levinson identifies is crowd-sourcing information from travellers in real-time via their smartphones and GPS e.g. Tom Tom congestion index. (re trend 12) The primary change here is people study longer and so enter the workforce later; and retire (or go part-time) earlier. (re trend 13) The likely timing is arguable, but when they get critical mass autonomous vehicles will likely constitute an enormous change to transport and land use. First: I acknowledge that road pricing exists more now than 40 years ago (a few urban implementations of cordons, a few HOT lanes, some time of day pricing on toll roads, bridges, and tunnels), so perhaps it is unfair to exclude, but its growth rate is really really slow. Toll shares of US transport revenue hovers in the 5-6% territory and isn’t changing much. So, to my disappointment, I don’t think it is a trend shaping transportation. I have become a pessimist on the actual adoption of road pricing in a significant way on existing facilities, aside from HOT lanes. While I can foresee an Odometer tax replacing the gas tax at some point, I am doubtful there will be widespread peak discounting, or that it will shape people’s behavior much at the level it will be set at. Second: Autonomous cars, certainly there are fewer autonomous cars than toll roads. The mileage of successful tests for autonomous cars is growing at an exponential rate, and is looking primed for take-off. This is more speculative than some others. However this feels like a trend which will shape transport. Third: Changes in working hours are due to increased productivity, primarily the increasing embeddedness of information technologies in general practice of everything that we do, so I think this is a social implication of a technology.